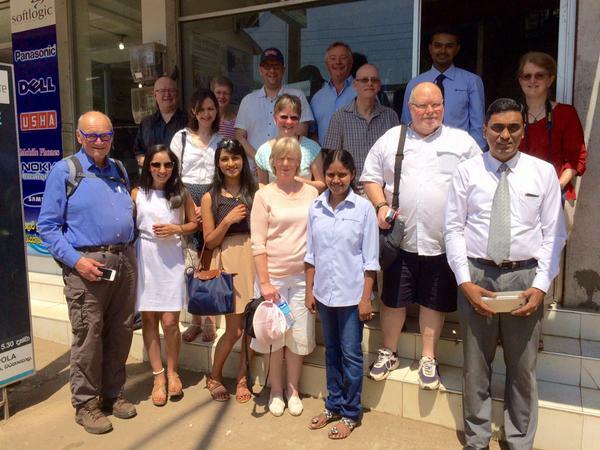 The optometry study tours are a real way to get a deep insight into a country. Firstly, there is something special about travelling with a group of like-minded individuals. Particularly when you get to meet colleagues doing the same job that you do, often in challenging conditions. What never ceases to surprise is how despite the many oceans that separate us, and the differences in rules, regulation and facilities, how there are so many similarities that bind us together. One of the highlights of our visit to Sri Lanka was the visit to the Brien Holden Vision Centre in Warakapola. Professor Brien Holden’s name, rightfully, must be one of the best-known in vision care. Not only a giant in contact lens research, through Optometry Giving Sight and his Vision Institute he has been instrumental in supporting global efforts to help eliminate avoidable blindness and impaired vision and reduce the disability, poverty and lack of opportunity associated with vision loss. The two hour bus journey on the A1 from Kandy to Warakapola passed quickly. The scenery really was truly spectacular. What a tragedy it would be for someone to be unable to witness it, particularly if all that was needed was a pair of glasses. We were not sure what to expect on our arrival in Warakapola . It turned out the vision centre was a practice much like any of us from the United Kingdom or Australia would recognise. Refreshments were passed around whilst we received a warm welcome from Sanjeewa Rodrigo, Brien Holden Vision Institute, Country Manager for Sri Lanka. The optometrist carried on with his examination whilst twenty of us crowded around. Sanjeewa proudly told us of the work of the Brien Holden Vision Institute. Their vision is that we should live in a world where any individual, anywhere, has access to affordable eye care. The statistics are staggering, it is estimated that globally 670 million are blind or visually impaired simply because they do not have glasses. The work in Sri Lanka started as a response to the humanitarian crisis created by the 2004 tsunami. Initially it was planned to provide emergency eye care and simply replace people’s glasses that had been lost. Soon it became apparent that the need was greater than that. Currently there is no training programme for optometrists in Sri Lanka. The gentleman we met was trained at L V Prasad Eye Insitute in India with sponsorship from the Institute. However before he could even start his training he had to learn Hindi. Now he was based in the practice in Warakapola and saw between 12 and 15 patients a day. Glasses were provided at an affordable price and the examination, which as well as refraction includes both an internal and external eye examination, was free. The vision centre operates as a social business organisation and delivers services without a profit. A project was on-going to establish a degree program in optometry at the University of Colombo. The goal is to increase the number of self-sustaining vision centres in Sri Lanka from the current four. Optical workshops are being set up to ensure a steady supply of affordable spectacles. 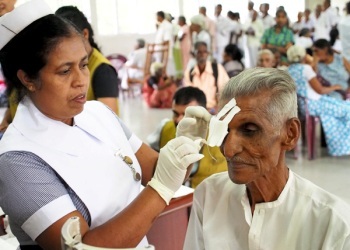 The Institute works closely with many stakeholders to facilitate educating local eye care practitioners, building infrastructure, creating viable partnerships, and championing the eye care profession to ensure that people across Sri Lanka have access to eye care. At the end of our visit we clambered back aboard our bus for the scenic drive back to Kandy. We left impressed by the work of the Brien Holden Vision Institute, had first hand experience of what happened to our donations to Optometry Gives Sight and the talk was all about, how could we help?